Some things can’t be explained. Not because there aren’t words to describe them or examples to compare them to. Something’s you will only truly understand when you feel them. Sad Love Song is like that, the best way you can understand it is by reading it. Only then will you truly feel what the characters feel. And even then it’s like the shadow beside you, close but yet always far. Love creeps up on some of us. It was like that for Hae-In and Jun-Young. Hae-In was blind, not all her life but suddenly out of nowhere she is. Her mother needing money moved to a different side of town and started making a living selling her body for money. As life would have it the owner of the place they are staying at is Jun-Young and his mother . All lead characters had one thing in common, they all had the same kind of sadness, which is actually said somewhere in the manga. It was that same sadness that bonded them with a hold so strong it surpassed distance. Hae-In is exemplary. Not only does she say just a few words at the beginning but her role is so important it changed lives. All of theirs actually. I fell in love with her character which faced, what someone would call her handicap, flawlessly. Her role was done with great detail and not exaggerated. Jun-Young had it rough growing up, which is really not surprising since a lot of people do. His struggle and choices were ones you wouldn’t done differently given the circumstances. He was brave and caring. Kon-Woo was fate. His whole existence was more like destiny than anything else. His role is a small one at first and then it blows up until he’s everywhere because he’s the same as them. They’re all linked. Some other characters deserve to be shot in the face because they are just so evil and selfish that evil and selfishness takes on whole new meaning. It’s because of those characters and life’s occurrences that we have here a magical story about a love so strong and powerful it takes a life of it’s own. The story is done with flashbacks. They show the present and to explain certain things they go back and paint us a pretty picture. Because as they say, “a picture is worth one thousand words.” It flows well and one of the only things I was confused about was the timeline. Not that it’s wrong, just I was confused as to how old the characters were through certain parts. Also that even after x amount of years they still looked the same, a lot of them anyway. But later it picked it up and adjusted. Something was nagging at me and it wasn’t until hours later that I realized what was it was. There was no retribution. No justice. People were screwed by life repeatedly in this manga and there was sometimes no happy ending for them. Actually for a lot of people we don’t know what happens to them even after it ends. I guess in that sense it’s a lot like life. The bad guys go free and the good get the short end. It was also interesting to read how it dealt with coincidences that forever joined them and change their lives. Or was it really a coincidence? The art is not necessarily beautiful but there something ominous about the characters expressions at the beginning. The more you submerge yourself in the manga the more you notice that the characters have their feelings written on their face. The happiness and sadness is printed there and you can feel for them through the art alone. I first notice in Jun-young’s eyes. They gave this empty feeling that made him seem like sadness was devouring him and he didn’t know what to do with it. Halfway through you when time passes you notice the clothing and the details are very nicely done. And that they look rather bright all together, beautiful. In itself it was simple in a way, above average but nothing extravagant. A love triangle that’s so beautiful and yet so awful it will break your heart, all while it’s mending in a never ending cycle. I really liked how the story flowed, narrating the past then showing us glimpses of the present. I wish that the mangaka explained how Hae-rin got blind and what happened to the other characters after. The story keeps on talking about karma but I didn't see any karma happen to the main antagonist. Though there is nothing new and very k-dramaish. I hate both the main characters. Hae-rin didn't really go through hell. She was just blind. She should have helped herself instead of always leaning on other people. She kept on about respect and pitying the handicaps but she herself is not helping herself. She does not work for her own nor help in the chores. When Joon-young was gone, she leaned on Ga-won. She doesn't have a backbone. She's so sucked into her sad sad life that she forgot that there are other people other than Joon-young. Joon-young is also the same with Hae-rin. His life wasn't that sad and yet he is so bitter with his life. I think Hae-rin and Joon-young are bad for each other. Opposites attract and when you have both characters in a downward spiral. The story would also go downward spiral. But Joon-young did the right thing while Hae-rin only made it hard for all of them. Feelings fluctuate and only in fiction will you find this kind of strong love. 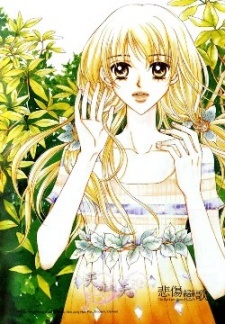 Love is unselfish, which is not true in the case of this manga. I have yet to read a manga that has strong female characters. This story somehow reminded me of Nicholas Spark novel "The Notebook". As it really happens in real life, even though two people are in love, there are a lot of obstacles in their way simply because they are not alone on this planet. In the end the choice is made between true friendship and love. I liked the sad reality of this story which was intertwined in every chapter, it made you also feel every character`s pain and wish for happy ending.... which is not always the only end of story. Overall 7/10 for this manga.